Four students from Sandringham School passed their Amateur Radio Foundation Exam yesterday. This brings the total of Sandringham students who have passed in the last six months to over 10. 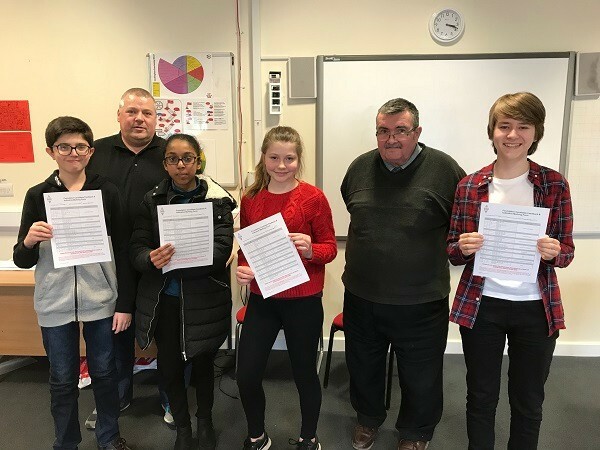 Pictured here (left to right) are Jude, Greg (M0PPG) – VARC Training Lead, Vashnie, Daisy, Norman (G8ATO) – VARC Senior Invigilator, and Joel. The candidates are awaiting their official certificates from the RSGB so that they can obtain their licences and call-signs from OFCOM. Sandringham School now have over 20 licenced operators within their student population and have their own club and shack on the premises. Headteacher Alan Gray (G4DJX) is a keen CW operator and the school works very closely with Verulam Amateur Radio Club (of which Alan is a long standing member) to promote amateur radio to the students through training and events such as Youngsters On The Air. Sandringham was also the first school to participate in the widely reported ISS contact with British Astronaut Tim Peake back in January 2016. The Verulam Club supported the school both with training the students who would participate in the contact, hosting a buildathon – supported by RSGB Chairman Steve Hartley (G0FUW) and with a presence/special event station on the day of the contact. Alan and a group of students will be visiting their sister school in the Gambia next week. Four licenced operators will be travelling as part of this group and they will be operating using the callsign C5DX. If you are interested in obtaining your Foundation Licence in Amateur Radio then please contact our training team by sending an email to training@verulam-arc.org.uk.